I owned 600 shares of SLW at a cost base of $26.97 per share. I wanted to protect myself against a drop in the market, so on October 18 I did a covered write, selling six contracts of the November 28 call options for $1.55 each. After commissions I generated $912.51 in cash. The net effect: I has sold the right to someone else to buy my shares at $28, provided they exercised that right before November 20, 2010. I was happy with that arrangement. If they bought my shares for $28, the profit on the shares would be $28 less the $26.97 I paid for them, plus the $1.55 I earned from the sale of the options. That’s a total profit of $2.58, or 9.5% (ignoring commissions) if the shares are worth $28 or more by November 28. Of course now that I have sold the options, I no longer participate in any upside above $28. So, for some upside, on October 25 I purchased another 400 shares for $27.82. But wait! I want protection! So, on October 28 I sold four contracts of the November 28 call option (covered by the 400 shares I own, since each contract represents 100 shares), for $1.25. The math: I paid $27.82 for the shares, so if they trade above $28 on November 28 my shares will be called, and I will get $28, so my profit will be $28 less the $27.82 I paid for the shares, plus the $1.25 in option premium, for a total profit of $1.43, or 5%. Not huge, but not bad for three week’s work. But wait! I want upside! So, on November 8 I sold four contracts of the November 36 call option (covered by the 400 shares I own, since each contract represents 100 shares), for $1.00. The math: I paid $29.49 for the shares, so if they trade above $36 on November 28 my shares will be called, and I will get $36, so my profit will be $236 less the $29.49 I paid for the shares, plus the $1.00 in option premium, for a total profit of $7.51, or 25%. That is huge, and it’s because the price took off to the upside, big time. 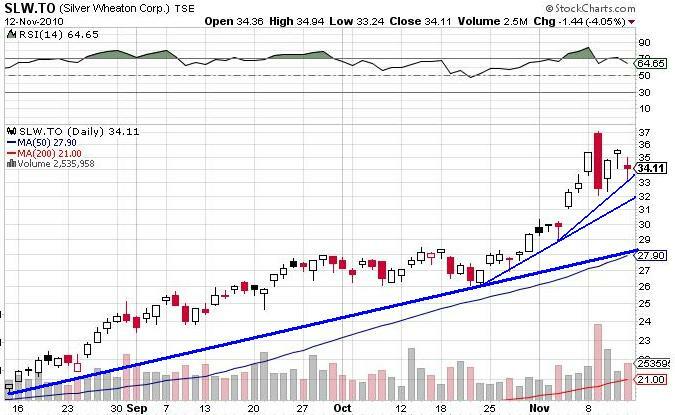 I can see that when a stock goes from $30 to $35 in three trading days, it’s getting toppy. Sure enough, on November 9, SLW traded as high as $37, and then crashed all the way down to $32. Of course the correction was made worse by the change in margin requirements on the futures exchange. 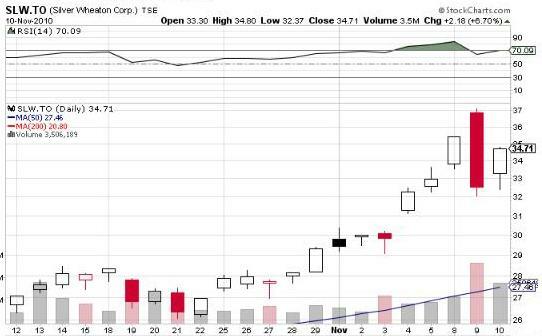 So, on November 19, I took the opportunity to re-purchase the November 36 calls for 50 cents. I had sold them two days earlier for $1, so that was a quick 50 cent profit. That also means I know own those 500 shares, uncovered, so I fully participate in any future upside. But wait! If volatility is my friend, would it not be wise to buy when the stock is down? Good point. So, as soon as I had repurchased the options, I bought another 500 shares of SLW, for $33.38. And, as luck would have it, the price recovered, so by the end of the day SLW was trading at $34.71. Volatility can be your friend. So, what are my holdings now? But I have sold the November 28 calls against 1,000 of those shares. 1,000 of my shares will be “called” at $28; my cost basis on those shares was ($26.97*500 + $29.49*500)/1000 = $28.23, so I lose 23 cents. However, I sold the calls for about $1.40, so I actually make a profit of $1.40 – .23, or $1.17. $1.17 on a $28.23 investment is 4%, over about a month, so that’s a decent rate of return on a failed investment. I still own 500 shares purchased for $33.38, so if SLW is trading at $34, I’m happy. “Buy to close” the November 28 options for $6.20. Then immediately sell the December 28 options for $6.70. By doing that I pocket 50 cents, but I also get to keep my shares for another month. Then immediately sell the November 34 options for $1.20. That transaction would cost me $5, but the shares are up $6 since I bought them, so I’m still ahead $1. A drop into the $29 range would not be surprising. That’s where the stock was two weeks ago, and it’s still above the medium term trend line. Then immediately sell the December 29 options for $5.80. It cost me 40 cents, but I keep my shares. I have a week until options expiry, so I see no point in making a rash decision this far out. When you sell options, time is your friend, because with each passing day their time value erodes. The longer you wait, the better. If the market crashes this week, due to the predicted Tipping Point, the options expire worthless, and I keep the premium. If the market runs higher, I wait until Friday, and buy back the November options I sold, which will have no time premium left, and sell the December calls, which, even at the same strike price, have time premium. In theory I can keep doing that indefinitely, pocketing premium along the way, until the market comes back to me. That’s my not-particularly-well-thought out plan, such as it is.